This past Saturday my husband and I attended a Halloween Kareoke party. This party had a costume required element. I'm not all that into dressing up and I'm really not into singing. 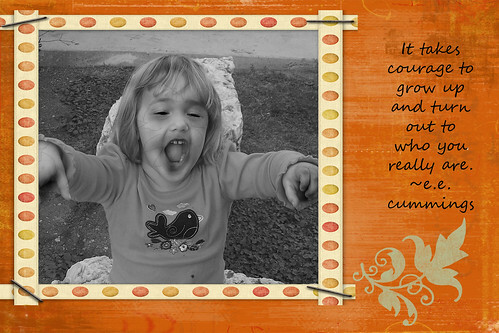 I made Fletcher a costume (I'll post pictures later this week) and for myself I made a scrapbook. 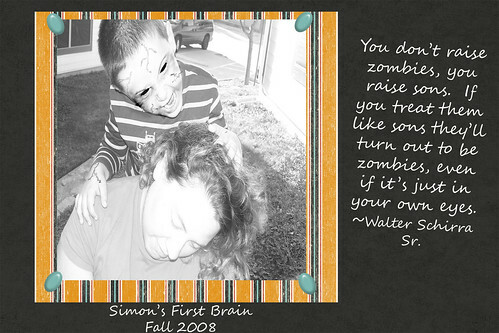 I decided I should be a zombie scrapbooker because really that's about the extent of how involved I cared to be. I borrowed an apron from Felicia that said "Scrapbookers do it all night long" wore a little make up and called it a night. 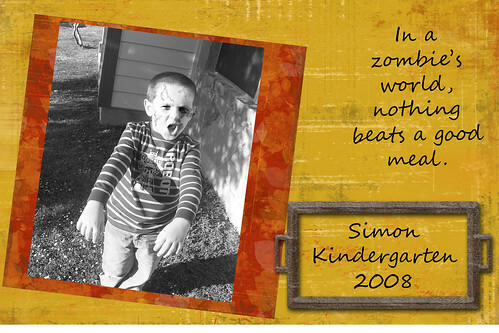 To authenticate my costume I did create a zombie digital scrapbook that I shared throughout the evening. Below are the pages I used.